Wall mount cabinets and ground standing cabinets are the two common types of network cabinets that provide platforms for housing equipment like switches or patch panels, keeping them in an organized and safe manner. 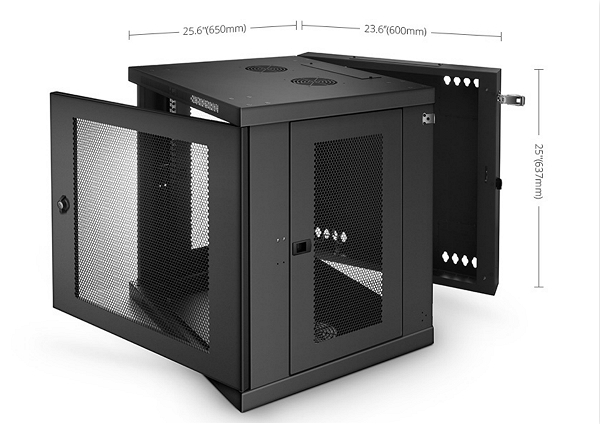 Ground standing server rack usually comes in 36U, 42U or 45U, which is used in data centers or large companies since it can house more equipment. On the other hand, wall mount cabinet are available in 6U, 9U, or 12U, which works well for small or home-based offices with a restricted amount of workspace, because it can be installed on walls for saving floor space. Here focuses on 12U wall mount cabinets, introducing the types and usage. Wall mount cabinets can be installed on walls, which is often used to house network switches, servers, patch panel or applications like telephone and audio/visual equipment. For 12U, the “U” stands for the rack unit that is an EIA standard measuring unit for rack mount type equipment. 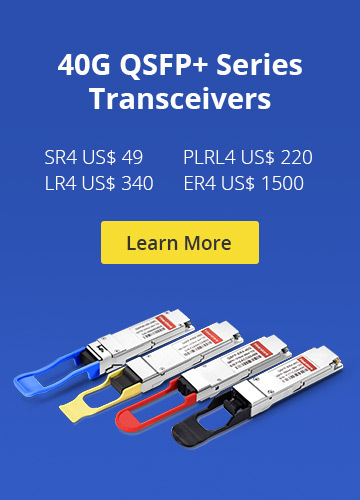 1U is equal to 1.75″ in height. A 12U wall cabinet means it would have 21″ internal usable space (12×1.75″). It can accommodate networking equipment with a maximum depth of about 17 inches (it’s better to leave about 3 or 4 inches space for airflow or adjustment), which is ideal for standard server or network switches installation. Compared with the large 42U network cabinets, this wall network cabinet uses a small and compact 12U design, which can be placed on desks or mounted on walls in classroom, retail store or office for storing equipment and saving floor space. In addition, with a 12U wall mount cabinet, users can easily access the servers and network equipment, and securely protect the equipment. Open frame, single section and double section wall mount cabinets are the common types. Open frame wall mount rack only consists of mounting rails without sides or doors. This unique design makes its installation a much easier job, and allows for unobstructed airflow, preventing heat build-up. 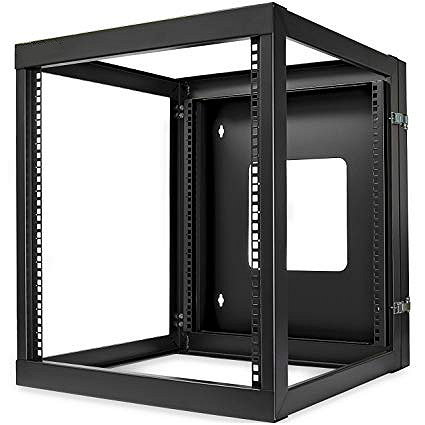 Besides, compared with the enclosed racks, open frame type offers easy access to equipment and cabling. And cable management is much easier as users can run the cables without any obstacles from doors or panel. This wall mount cabinet type is suitable for environments that require better airflow and easier access, such as in a factory. This is the most common wall mount cabinet type. Usually, it has one front door that can be open, closed or locked to keep the inside networking equipment safe and organized. In most cases, the single section wall mount network cabinet will be installed on the wall with the door facing outward, and the equipment facing the door for easier access. The door can be locked for sensitive data protection. It also helps protect the equipment against dust or water. Single section wall mount rack can be applied in the places that require better security and protection like the technology department of a company. The following is a 12U wall mount cabinet with glass front door from FS. It uses SPCC material, which is sturdy and durable that provides a stationary weight capacity of 60kg. Plus, the glass front door design can protect your equipment against dust. Figure 2: 12U wall mount storage cabinet with glass door. Double section or hinged wall mount cabinet is mounted on the wall, and provides an access door on the front. When it needs to access the back side of mounted devices inside the cabinet, this entire cabinet can swing out away from the wall without dismounting the cabinet, as it’s installed on hinges with back section. This strong back hinge makes it much easier to run new cabling, replace some equipment parts and so on. It’s suitable for those who need to access the back side to change device parts. The following is an example of 12U hinged cabinet from FS. It uses vented front door design, which allows generous airflow. The cabinet can swing away from the wall on a sturdy hinge, providing easy back-door access to equipment and cabling during installation and maintenance. Figure 3: 12U double section wall mount rack. What Kind of Equipment Can I Put In the Wall Mount Cabinets? Wall mount cabinets are great places to store things like servers, IT-related boards, and of course, switches and patch panels. But aside from the standard equipment, there are some other things that can be mounted in the cabinet. For example, an UPS for power backup can be installed inside the rack. This will come in handy when the power goes out. The following picture shows the application of a 12U wall mount cabinet. It houses two network switches, two patch panels and horizontal cable managers with finger duct, providing a good storage solution for the equipment. 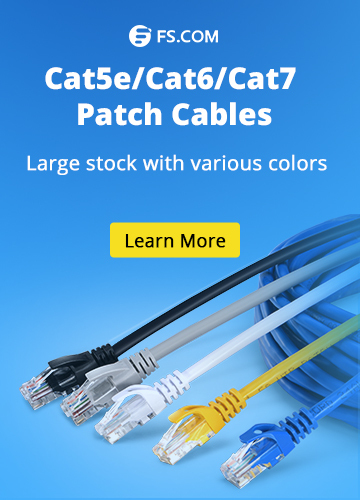 In this way, network cables are handled in an organized way through patch panels and cable managers, which makes the cables’ installation and maintenance easier, improving working efficiency. In addition, the managed devices and cables can reduce network failures, helping users building a neat and professional network environment. 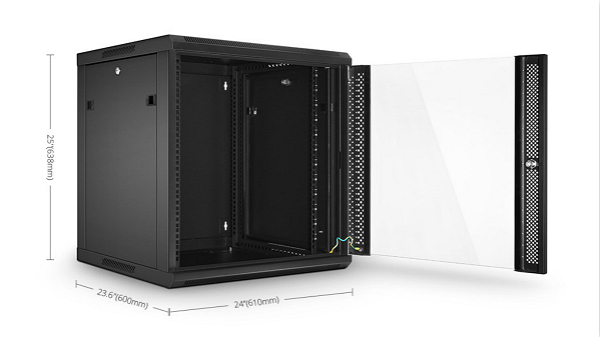 Figure 4: Application of 12U wall mount network cabinet. 12U wall mount cabinets are cost-effective networking storage solutions for small business and home use. 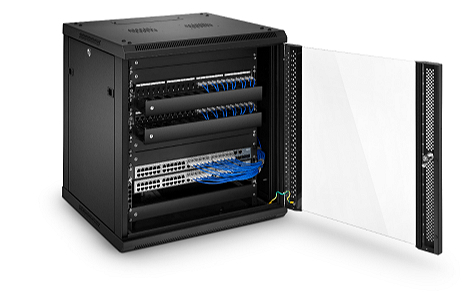 They can accommodate switches, servers or patch panels for protection, offering quick and easy access for users. The three wall mount cabinets types are used in different environments. Open frame type is great for environments that need better airflow such as factory. Single section type provides security to protect devices from dust and other hazards, which can be used in classroom or office. Double section type provides rear access to equipment and wiring, which is suitable for those who require back access for changing device parts. FS has released 12U single and double section wall mount cabinets with robust design and favorable price to protect your devices. If you still have any question about wall mount cabinets, contact us via us. @fs.com or live chat, we are here 24/7. Cables Management data cabinet, server rack, wall mount cabinet, wall mount rack, wall network cabinet. permalink.